This is a high calibre boot sale, with sellers offering a never-ending array of designer gear and vintage finds. If you are fancying an afternoon packed full of boot sale hunting, you can do Capital Car Boot and the nearby (by car anyway!) Battersea Car Boot. Both worth a visit. If you don't come away with something amazing, you are not looking properly. My last visit delivered a vintage Versace ladies shirt, 2 unworn Top Shop Unique dresses and sheepskin rug. Very happy shopping! The BEST carboot sale in London. Very well run & exceptional management. Bargains galore. Great atmosphere, even better bargains. Centrally located and extremely well organized. I am a regular! 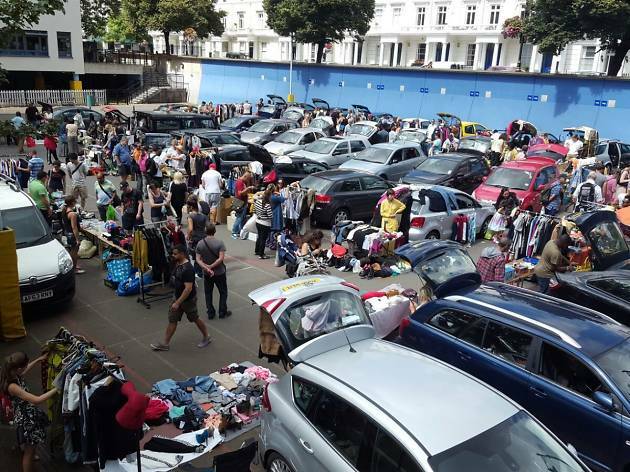 The most interesting, well organised, friendly, eclectic, fun, accessible, value-for-money car-boot venue in London, both for punters and sellers. For second-hand anything; books, designer clothes, toys and dvds, you want it, Capital will possibly have it. Give it a go and test your negotiating skills! Oh, and it's great just for people watching. Brilliant car boot, I've been comming every Sunday for years and it just get better and better.. I go to a lot of car boots, this one is not only well run, but you have the choice of being indoors or out, which is perfect for the Great British weather! There's always a good number of buyers and stalls, I always find something I can't leave without! Fantastic car boot sale in the city. Love it! The one and only carboot with a guaranteed friendly atmosphere and brilliant range of sellers. Love it! Great place to stay up unique finds and a perfect day out! Well organised and a lovely experience! Definitely a must stop! Excellent well-run car boot sale! Faye who has the hard dedicated team,as well as the stamina to have keep this car boot running to the highest standards has encouraged me for the last 2 years continue to sell my goods there. love this booty - always pick up a little gem or two! Cannot tell you how many times i have found a hidden gem here! 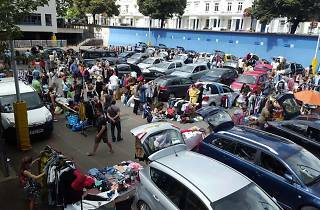 Every week you can find amazing bargains and treasures at this well-organised car boot. A must-do on a Sunday morning. Brilliant car boot every Sunday with a wide range of goods on sale. 3 playgrounds of stalls and some inside too! Come and join us. Amazingly great carboot. Great for walk-in sellers as unlimited space and can set up any where in the court yard. Unlike other bootfairs. Good array of goods on offer and a good atmosphere. Everyone is friendly and provides a good buying and selling service. And it is not even summer yet. What vintage?! It is not worth the entry fee to look around at 10 or 20 sellers, mostly selling junk at hugely inflated (and deluded) prices due to the 'vintage' label this car boot sale has given itself. No 'amazing' finds for me and I've given it several goes now. I don't know how they can justify their high level entry fee for buyers when they have so few sellers, it's simply not worthwhile. Sorry, but this boot sale is a lot of hippy hype with no real substance in my opinion. Great carboot with good offering of in-door and outdoor space. Plus lots of gems to find including designer clothes and antique furniture. I'll definitely be going back! I visited here for the first time on Sunday. AND I LOVED IT! Soooo many bargains to be had it was ridiculous. Really fun, friendly and a great day out. I’ve even booked to sell in a couple of weeks time- I can tell I am going to be a regular! This car boot is relatively new on the booting scene. It probably has bags of potential to grow and become one of London's top Car Boot spots....but, it's taking it time! I pop by once every couple of months to hopefully have a good rummage, but sadly.... I never seem to find much! On the whole it consists of small table-top traders selling an odd array of secondhand junk and an abundance of last seasons clothing (inc.the odd designer label) with the occasional piece of vintage paraphernalia thrown in for good measure. Prices here are slightly inflated with little scope to barter. On the plus side it one of the more civilised Boots... you'll find no scums here but, a peaceful and perhaps more tranquil atmosphere both indoors and out. If you're after secondhand clothing and shoes, ....then this is one boot to visit. best car boot i have ever been to and extremely well organized .very upmarket with very nice clientelle and quality goods,not cheap rubbish that i ve seen in other ones.its also very clean with indoor facilities which by far stands out from the rest.the organizers are civilized,supportive and polite and kind and you dont hear any of the shouting and screaming that takes place in battersea.its an absolute pleasure to buy and sell here and it would be very difficult,if not impossible to beat this one. This carboot is excellently organised and extremely friendly and fun. I have had two very successful selling days with my car and thinks it's the perfect carboot experience. This carboot sale is extremely well organised and a real pleasure to take part in. I have taken a car full of stuff twice now and had excellent sales on both days. Very friendly, civilised and fun! A great indoor and outdoor bootfair selling a wide range of stuff, much of it quality goods. Great organisation from the beginning for the sellers, providing trolleys to move your goods around. They even give you a table if you book indoors. However, the best part of it is that it is civilised, unlike others I have been to.